FALKENBACH alias Vratyas Vakyas has been around for 22 years, and plays pagan Viking metal. The folk music tendencies spent seven demos developing its anthem style before it was time for the debut album. The album, “Fireblade”, was plagued with studio problems and was never released. The second, “… En Their Medh Riki Fara…” marked their debut for Napalm Records, their home to this day. 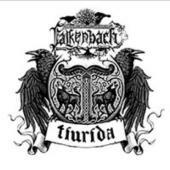 The epic features are important to FALKENBACH´s , raw parts, choirs, Tyr and Odin, and sedated interludes. Is this as interesting as it sounds? The intro is in all simplicity a gloomy reminder of Armageddon. Vratyas is not into black or anything growled, but sings in a clean voice. Acoustic guitar and an epic melody in “normal pace” contribute to making “…Where His Ravens Fly…” pleasant listening. For those with a penchant for heaviness and brutality there is the choir laden yet nearly growled “Time Between Dog and Wolf” where the guitar has some added bite too. This far, the atmosphere is reminiscent of BATHORY`S underestimated “Twilight of the Gods”, softer in places, but all in all an atmospheric time travel. The instrumental “Tanfana” is almost catchy in an old-fashioned way, but a fine 5.32. The music moves in the balance between heavy and water combed, only the heavier almost distorted vocals in two songs disturb the peace. But the raunchier style destroys a lot in “Time Between Dog and Wolf” and “In Flames”. On the spot songs like “…Where His Ravens Fly” and the closing candy bar “Sunnavend” raises the mark to a strong 4/5.